The MCK is strongly advising landlords enter into lease agreements with tenants and that tenants purchase renter's insurance. The RLF Mortgage Loan is intended to provide qualified applicants with a mortgage loan for the complete construction of a new house using funds from the Revolving Loan Fund (maximum $175,000.00). The program requires a down payment contribution from the applicant in the minimum amount of five percent (5%) of the mortgage principle. This program is targeted to eligible Kahnawa’kehró:non who are gainfully employed, in the middle-to-upper income bracket, who require suitable housing on reserve. These individuals must be willing to take on a debt in the form of a mortgage, with land held as collateral by the Mohawks of Kahnawà:ke. 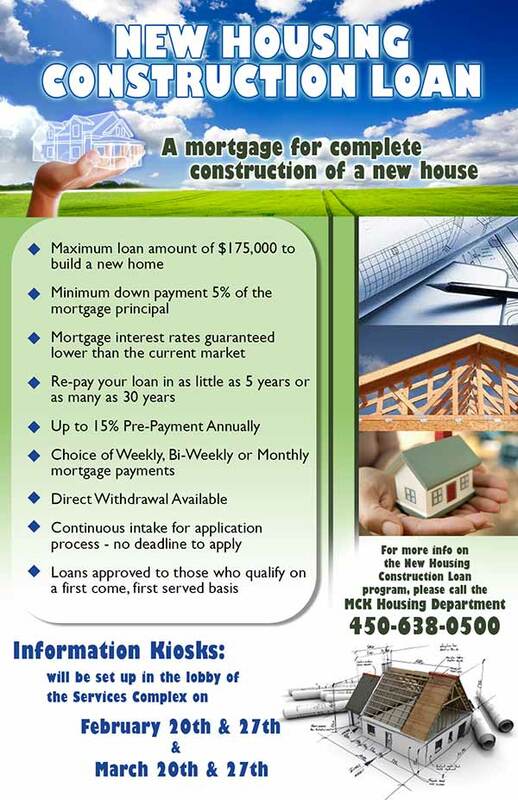 The New Construction Loan Program has continuous intake. The HRLP provides loan access up to a maximum of $25,000 for the basic repair of a house, to correct deficiencies, prevent deterioration, and to raise the standards of the house. There may be an equity contribution required from the applicant in the event the cost of the desired repairs exceed the $25,000. maximum loan. HRLP has continuous intake and applicants can access this loan more than once. The Housing Department acts as the Delivery Agent for Canada Mortgage & Housing Corporation (CMHC) to administer the Residential Rehabilitation Assistance Program (RRAP) & RRAP for community members with a disability. This program is intended to assist in the repair and improvement of existing substandard housing in Kahnawá:ke, to raise it to minimum level of health & safety, as well as address modifications to a house to address handicap needs. Funding is provided in the form of a grant from the Department of Indian Affairs and a forgivable loan from CMHC. ERP offers financial assistance to help low-income households make emergency repairs required for the continued safe occupancy of their home. Homeowner’s incomes who are at or below the established thresholds for the area are eligible to apply for financial assistance. HASI assists homeowners pay for minor home adaptations to extend the time seniors can live in their own homes independently. Secondary/Garden Suite (RRAP) assists in the creation of affordable housing for low-income seniors and adults with a disability by providing financial assistance to convert/develop existing residential properties that can reasonably accommodate a secondary self-contained unit. All CMHC Programs are subject to eligible criteria and annual funding allocation. Multi-Dwelling is a social housing rental program geared towards low-moderate income families. It provides affordable, transitional rental accommodations, suited for families. Support through Housing Case Management is provided to assist the tenant in achieving future homeownership. One bedroom housing rental geared towards low income single adults (male or female) who are experiencing challenges that have resulted in the inability to access private rental housing in the community. Tenants must be willing to work with MCK Housing in the development of a case management plan during their tenancy. The RTE is intended to build equity for future homeowners of lower-to- middle-income Kahnawakérho:non who qualify and who might otherwise find it impossible save for the necessary down payment on a mortgage loan. The Program offers 3 bedroom rental housing combined with a scheduled savings component to facilitate accumulation of the necessary funds to enter the housing market. The RTE is targes eligible Kahnawakehró:non who are close to being financially capable of home ownership but require some financial assistance, particularly in saving the down payment. They should be gainfully employed, in the lower-to-middle income bracket, and require suitable housing on-reserve. Because there are three (3) models of programming, there are also three (3) income brackets for qualification. These individuals must be willing to work with the Kahnawà:ke Housing Department Case Management in order to determine eligibility and at what income bracket they qualify. The HOPE is a four year job readiness program featuring affordable 3 bedroom rental housing, training/education and a home ownership savings plan targeted to eligible Kahnawakehró:non single parents with children who are willing to improve their present circumstances, and their children’s futures, by working towards attainable goals through the enhancement of their marketable skill set. 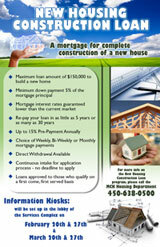 This program combines educational and financial goals towards the achievement of a career and down payment for a house. These individuals must be willing to work with Social Development Case Management which consists of the Housing Department, Social Assistance Department, a Mentor chosen by the applicant and other partner organizations in order to identify a long term case plan toward achieving success. Other community services will also be included in the work plan for the possible provision of daycare, transportation, training allowances and training milestone requirements. This program provides a service to Kahnawa'kehró:non who are self-funding construction of a new home or expanding an existing home. The Housing Department, through plan & contract review, as well as inspection services ensures proper construction which adheres to the Building Code and Construction Standards of the MCK. All fees for such services will be charged to the individual homeowner and will be payable to the MCK Housing Department. For more information, contact the Housing Department. There is eligibility criteria for all housing programs. Contact the Housing Department to obtain further information.